-Cops enjoying festivals. The police more often than not during the many festive occasions in India would jump into the mix, becoming joyful participants rather than shutting them down. -Men holding hands. Love the lack of shame in men showing affection towards each other! -Monkeys making it thunder while clambering across the tin roof or sitting nursing their babies, watching us aspiring yogis with puzzled expressions while we perfected our form in downward dog. -Colors. All of them. Everywhere. -Delicious, inexpensive, perfectly spiced meals. With infinity types of bread. Maybe worth all the pooping. -Eating with my hands. So fun! -Massive, vine-covered, green, mossy trees. Pure magic. -Not having nearly every social gathering revolve around alcohol. -Sanskrit lettering, has there ever been a more beautiful written language? -Inexpensive yoga classes and Ayurvedic massages and fresh juice, nonexistent in California. -Papaya! Dear God, I don’t know if I’ve ever tasted anything quite so delicious as Indian papaya. One bite would cause me to wax poetic for the rest of the meal, I’m sure my dining companions looooved it. -Sunsets. The big red ball of a sun sinking into the mist behind the emerald Himalayas, while conch shells sounded from the banks of the Ganges, was pretty unforgettable. -Crickets singing me to sleep. -Being in bed/ usually asleep by 9:30pm every night. -Sweet faced cows with their surprising grace, able to delicately lift their back legs to precisely scratch the tips of their noses. -Waking up at 5:30 every morning. I was so confident I would at last be one of those elusive morning people by the end of my time in India, but it’s just not in my DNA. -Poop. On the ground, coming out of me, everywhere, all the time. -Heat and humidity. No one likes feeling like a hot, wet blanket has been thrown on top of you just because you went outside. -Honking horns. I never want to hear another horn for the rest of my life. -Poor service in restaurants. I don’t think I ever actually got what I ordered the entire time I was in India, despite having it repeated back to me and seeing it written down. Makes no sense. -Not understanding English… the Indian accent was a challenge for me, the amount of time I was left puzzling what had been said after someone had spoken to me in my mother tongue made me feel like an idiot. -People (men) cutting me in line. I want to cry sexism but I’m just not sure. -Feeling scandalous for exposing my knees. -Not using vowels. Vrt is a real word. I never had a chance. -People taking pictures of me/ with me. Still unclear why anyone would enjoy having a selfie taken with me, or what they do with it later. -Crazy drivers. Said a lot of Hail Marys in the back of taxis, and I’m not even Catholic. -Staring! UGH. Men. Staring. Without pause. At me. Everywhere. All the time. Culturally not rude, I know, and I was warned about it in advance but it still shocked me and made me feel incredibly uncomfortable as a woman traveling alone. -Again, cows, with their intimidatingly large horns and loud bellows, causing traffic jams and blocking narrow alleyways. After a week recovering from life in the clouds, I spent another 8 days trekking through the Markha Valley with some of my best friends from college. After days filled with laughter and snow-capped summits and skies more starry than I thought possible, it was finally time to leave my now beloved Leh. 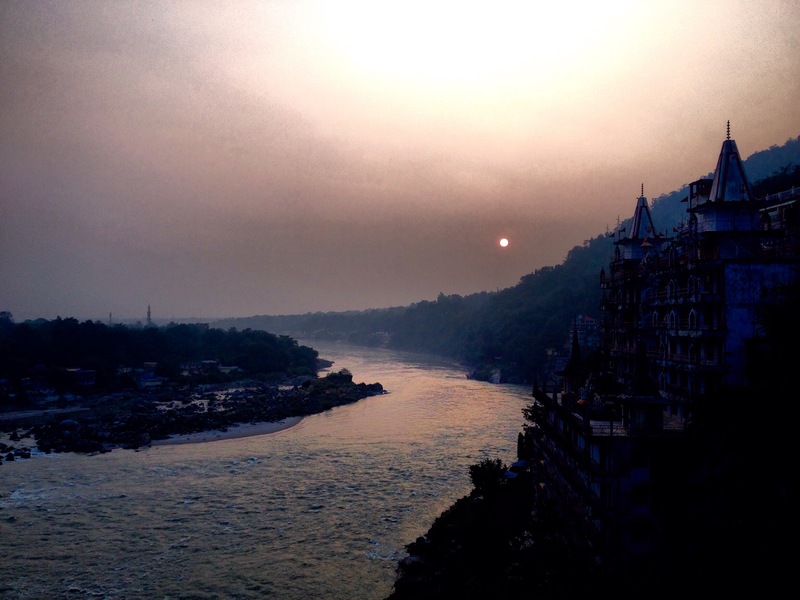 I arrived in Rishikesh after a south-bound flight over massive peaks, a steamy jungle town nestled in the foothills of the Himalayas, cut perfectly through the middle by the mighty Ganges River.